When it comes to solving the “what’s for dinner” dilemma, chicken and beef have long fulfilled the role as consumers’ primary center-of-the-plate protein. While that preference continues to prove true today, pork is certainly giving its forerunners a run for their money. Consumers are going hog wild for pork products, from pulled pork to bacon to pork belly. The U.S. Department of Agriculture predicts that overall U.S. pork consumption in 2018 will reach a record high of 53.3 pounds per person, which can be attributed to both declining pork prices and the rising appearance of pork across menus and globally inspired dishes such as tonkatsu. What’s more, changes in quality standards and cooking methods, coupled with consumers’ desire for diverse cuts of meat and flavor profiles, have helped pork emerge from the shadows of its chicken and beef counterparts and into the spotlight. 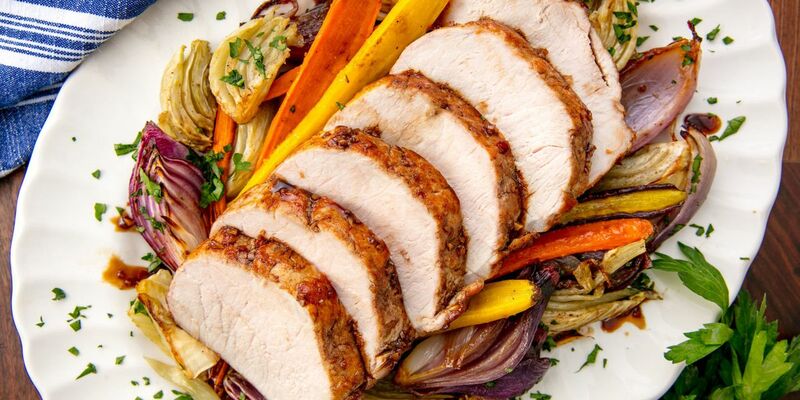 A healthy alternative to chicken and beef, and a mainstay in Asian and Hispanic cuisines, pork satisfies consumers’ cravings for both healthful and ethnic foods. However, though common and highly desired today in restaurant and foodservice offerings, fresh pork can still be a hard sell in the grocery space due to shoppers’ lack of product knowledge and cooking confidence. As such, retailers have an opportunity to cash in on consumers’ affinity for pork by clearly conveying its health attributes, types of cuts, preparation techniques and flavorful recipes. Retailers can offer fresh packaged and seasoned pork as an approachable entry point for shoppers seeking to bring their taste for pork into their own kitchens. The marinated category has particularly driven growth for family-owned Hatfield, Murphy says, including its All Natural Dry Rubbed tenderloins and loin filets. “Exciting flavor profiles, easy entry cooking products and inspirational recipes can give consumers confidence and regain their confidence in pork,” she says. With a mission to increase consumption of pork in the U.S., the NPB examines consumer behaviors to better understand barriers to purchase and ultimately use those insights to drive innovation at the meat counter. The organization recently held its annual Pork Summit in Cedar Rapids, Iowa, in late July, which rounded up dozens of chefs, pork producers and industry experts to share and absorb information on butchering, cooking techniques, health attributes and unique recipes. Improved standards for animal health and welfare practices have elevated the quality and safety of pork in the past few decades. In May 2011, the USDA revised its recommended internal temperature for cooked pork from 160 degrees Fahrenheit to 145, with a three-minute rest time, which yields a finished product that is pinker in color than most home cooks are accustomed to, according to a statement from the NPB at the time. However, many consumers still tend to overcook their pork as the stigma continues to linger. As such, retailers must offer meat counter experts, signage and cooking instructions to convey these facts and techniques to their shoppers. While price and flavor are prominent factors influencing consumers’ food purchasing decisions, wellness and production practices—including health, animal welfare and origin—are becoming increasingly important, according to a recent report from data analytics and research firm Category Partners, Idaho Falls, Idaho. In addition to offering product, cooking and recipe information, retailers can offer shoppers a behind-the-scenes look into how hogs are raised to build consumer trust and confidence in the product. “Consumers are much more engaged with their food with hopes that it connects to their life values and health goals,” Harrison of Tyson says, pointing out that antibiotic- and hormone-free products have seen a volume compound annual growth rate of 14%, according to The Power of Meat 2018 report. The convergence of health and sustainability was one of the top takeaways from the 2018 Pork Summit, where Leon Sheets, America’s Pig Farmer of the Year, discussed his experience in the industry, including sustainable farming and how animal welfare practices not only appeal to consumers’ demand for transparency but also improve the quality and taste of pork.